Ok so I have not been doing as much scrapbooking since having Austin, but slowly getting on track with that. Need to get some of those first month photos done in layouts so that I don't fall behind! This project I did before I had him, but was not able to finish it off with the ribbon until he arrived as if it was a girl the ribbon was going to be pink. 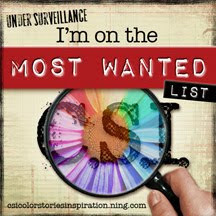 I finished it off last week with the ribbon and have just taken some photos. The box is made from MDF and my lovely husband cut the wood and glued it together for me so that I could have it made to the dimensions that would fit the nappies nicely. 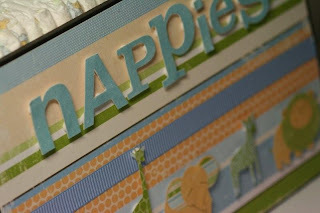 I made it using some really cute Making memories paper which match the room theme of safari animals. This is really cute Bec!!! and will look gorgeous in your nursery. When are you going to bring yourself and your beautiful little boy in to visit us all at work? Hey Bec, how are you going. Although I am way past the nappy thing its still a very adorable project. I bet Austin's room is just sooooo cute. hey bec! thanks for the comment!! oh i love your little nappy bin!! gorgeous! cant wait to see you! Ive been meaning to drop in and see you - but obviously havent! I must try and catch you! 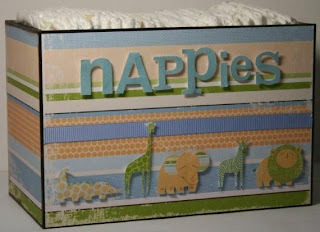 Love the nappy box.. very very cute!